GeekGirlCon’s two-day convention sets up an inclusive environment in the heart of downtown Seattle to celebrate every geek and honor the legacy of women contributing to science and technology; comics, arts, and literature; game play and game design; and beyond. But our work continues beyond con weekend to bring you gaming and geeky events all year round! Here’s some stuff you can check out around Seattle. Board Game Night at Wayward Coffee! Do you love board games or think you might? 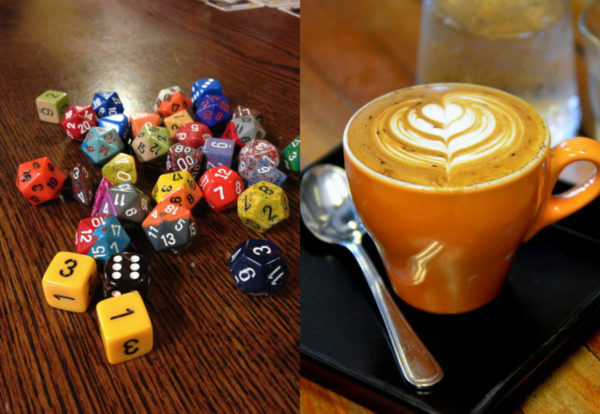 Explore the board game hobby in a friendly, inclusive environment at Wayward Coffeehouse! Join GeekGirlCon staffers, make new friends, play games, and enjoy some delicious organic, fair trade coffee. Hosted, free of charge, every 2nd and 4th Friday of each month. Find out about game and times on our Meetup page here, where you can RSVP! The Girl Scouts of Western Washington build girls of courage, confidence and character; all qualities that GeekGirlCon loves to celebrate! It’s only natural that our two amazing organizations should join forces to form an initiative called GeekGirlScouts. 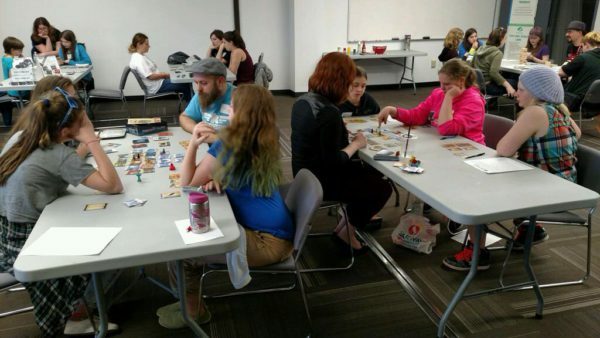 During our two year partnership, GeekGirlScouts have had several tabletop events where they’ve learned to play a variety of boardgames, card games (such as Magic: The Gathering) and even roleplaying games like Dungeons & Dragons and Dread. Full tables for a tabletop event. Photo credit: Kristine Hassell. They’ve also gone on tours of awesome, local companies and institutions, like Wizards of the Coast and DigiPen University. And there are more events and tours to come! Our brilliant writers at GeekGirlCon aggregate a monthly list of activities on the GeekGirlCon blog! Stay in the know about geeky events around town by subscribing to our blog here. Our intrepid team of GeekGirlCon staffers take part in the annual Seattle-area challenge: The Gauntlet! Twenty teams of four players each come from games industry businesses and local community groups. Throughout the 10-hour invitational tournament, the teams play tabletop games from start to finish for the honor of hoisting the Gauntlet in victory. Their supporters are on hand to cheer them on or watching from home as the tournament unfolds, live, on the Card Kingdom Twitch channel! In 2014, $26,000 was raised for Child’s Play, a charitable organization that donates toys and games to children’s hospitals worldwide. In 2015, The Gauntlet: Moxtropolis raised $92,000 to benefit Hopelink, a charity whose mission is to support homeless and low-income families on their way to self-sufficiency. In 2016, over $70,000 was raised to benefit YouthCare, a charity whose mission is to help homeless youth get off the streets and prepare for life. In the last three years, $188,000 has been raised by Seattle gamers. We’ll keep you posted on how you can join in the GeekGirlCon fundraising efforts as we get closer to the 2017 date! PAX West is one of the biggest gaming conventions of the year. For the past three years, GeekGirlCon makes an annual appearance in the PAX Diversity Lounge. The Diversity Lounge was first launched in Boston at PAX East in 2014 by Benjamin Williams, co-founder of the Lounge and also GaymerX. The idea behind the Lounge was to offer a space with a specific focus on diversity where PAX attendees could find organizations that represent diverse groups in the industry that might not necessarily get exposure otherwise. GeekGirlCon always has smiling faces and CANDY in the diversity lounge. As people stop by to ask questions about our celebratory convention, we also take the opportunity to discuss our mission of inclusion and diversity. We love to hear from you year-round on our social platforms. Follow us on Facebook, Instagram, Tumblr, and Twitter here.